Even Fantasy Flight Games couldn’t squeeze another expansion out of Arkham Horror, and revamping the game would cause all manner of confusion considering its large brood of expansions. 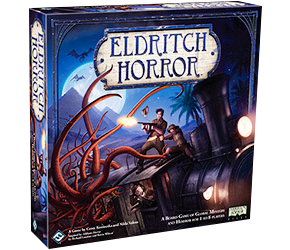 So they sensibly created a new game ‘inspired’ by the classic: Eldritch Horror. This one moves the action out of Arkham and its environs and makes the whole business global. It also streamlines and improves the Arkham Horror rules to make a faster (but not that fast, this is still a long game and will take 2-3 hours at least) and sleeker beast. Despite my cynicism, this is a clever revamp of the system, with most of the fiddly bits filed off and a greater emphasis on the story. Each of the Ancient Ones has its own deck of research encounters and ‘mysteries’ you must solve in order to stave off the inevitable end of the world. And you can even visit the last locations of defeated investigators for a last bit of story filler, depending on whether they went insane or ended up in hospital … or worse. Just to check – if I already have the previous v2 sheets printed out, am I missing any other changes if I just print the Mountains of Madness sheet? Thanks again for the great work you do! There were a few small changes throughout the document (I can’t remember exactly what they were), so I’d print a new copy. Sorry I can’t be more specific but sometimes changes are done of a period and I forget the exact fixes. No problem at all, happy to reprint as I don’t want to miss anything! Thanks for the quick response. Will these plans fit the forgotten lore expansion and wil it fit the cards if they are sleeved? Yes, Forsaken Lore will fit, but no, sleeved cards probably won’t. I’m sure you can use this as a basis for your own design. Inserts that accommodate sleeved cards usually mean making big design compromises, so on the whole inserts here don’t accommodate the minority of people who sleeve their cards. Of course that doesn’t stop you modifying the designs to your own specs! I finished yesterday night my foamcore box and it looks amazing!! The design is brilliant and and the guide is perfect, congratulations Universal Head! Regarding the card sleeves I have the all of the cards sleeved and they fit perfectly (I only own the base game but there is plenty of room for at least 1-2 smal expansions). The only minor “issue”, due to the card sleeves, is that I can’t reach the end of the box with one finger where the “A” card dividers are placed so I have to get out the big cards in two moves (irrelevant for me). Thank you again for your hard work the whole website and content is AMAZING! This stuff is really awesome. I’ll be throwing money at you momentarily. Any chance we’ll get an Under the Pyramids update before Christmas? My sister is a huge fan of Arkham and Eldritch. I thought this stuff, printed and bound would make a nice little stocking stuffer. Which would be my only critique, albeit minor, is some of the pages don’t have room along the side to hole punch them for binding. Of course, I may be the only person who thinks that’s a good idea. And of course, I’m sure there is a way I can make that happen my self if I poke at Adobe enough. Thank you Brett, throw away! 🙂 I can’t update this yet unfortunately because FFG haven’t released the rulebook as a PDF and I can’t buy it here yet! I’ll update it as soon as I am able. I’m afraid there’s no accommodation for ring binding because, well, you’re the only person who’s mentioned a desire to do so in over a decade of doing these things. 🙂 I find trimming and laminating gives me the best result. Is it somehow possible to get a version of the rules summary without background images? I would be really grateful. I’ll create a B&W version very soon. Keep an eye out for it! The work you have done here with these quick reference sheets/game guides is phenomenal. I must applaud you for this, as it is of great help to speed up the game when in doubt about something, and not having to run through the entire game manual. The material for both Eldrith Horror and Arkham Horror is spectacular. All printed, laminated and put to use around our gaming table. Looking forward for the version for the recent “Under the Pyramids” expansion. Cheers Paul. Will be updating this for that expansion soon. Foamcore Box Plans v1 are enough to fit the expansions too? No, it will not fit the large box expansions. Just finished up my own insert for these plans. My cutting and gluing work is still pretty clumsy, but overall I feel good about it! Thank you for the plans, and it appears there’s enough space to include Forsaken Lore and/or Strange Remnants as well! Super happy about that! Hey, fantastic work you did there. I wanted to ask you if you included the latest updates from the FAQ posted on FFG page? If you open the FAQ file you will read: Last updated on January 19, 2016. I had a look; there are no things that needed to be added to the summary, just specific FAQ stuff. Was told by a retailer that the latest expansion, Carcosa, is missing something from box. He didn’t say what, but I’ve contacted FFG to find out what situation is. They usually send missing bits and updates for free, but holding off buying for now. Really think I should cut back on my expansions buying. So many cards. Conditions are the worst, they get so complex with + and – modifiers, especially with Impairments and Advancements. The big boxes are good, Under the Pyramids and Mountains of Madness sideboards add to the game, but the small expansions just seem to complicate it. Tempted to pull the cards and tokens from those 3, but separating so many cards out is a daunting task. I agree with you; there’s a point where you have to weigh up how often a game gets to the table with how many ‘bulking out’ expansions you get. If I played this all the time maybe I’d be interested, but right now I feel no need to get another one (and I haven’t got Under the Pyramids yet either). The completist urge is expensive and often unnecessary. Might end up selling it instead, or at least getting rid of expansions. Could do with a clear out to be honest. Some games may never get played again. Stripped Eldritch back to basics by removing all expansions. Took a couple of hours to separate everything. Played the base game vs Azathoth and lost… Completed 3 mysteries, but first one was put back in Mystery deck by a Mythos card…. Anyway… It needs some of the expansions to bulk out out the decks, had to shuffle three of them when I ran out of cards. Forsaken Lore is obvious one, but not sure after that. I like focus tokens… they help a bit. May end up picking and choosing what to add. My game. My choice. Sorry to hog this feed, but I contacted FFG (aka Asmodee now) to see if they have any plans to print an errata box like they did for the botched Forbidden Alchemy for Mansions of Madness. Sadly I was told that was not going to happen. Pity, as the errata is getting rather extensive it’s a tiresome matter to look up flawed text on cards during the game. I may simply remove the flawed cards (unless vital to the game) to avoid looking things up. So is the V4 Summary good to up Strange Remnants, would anything critical be missing if a game included expansions up to Dreamlands? I’m sure they’ve introduced more things in the other expansions. When I have the time, I’ll update this reference. I, too, was looking for an update. There is a new big-box expansion coming out in Q1 2018, FYI. It will introduce campaign rules!